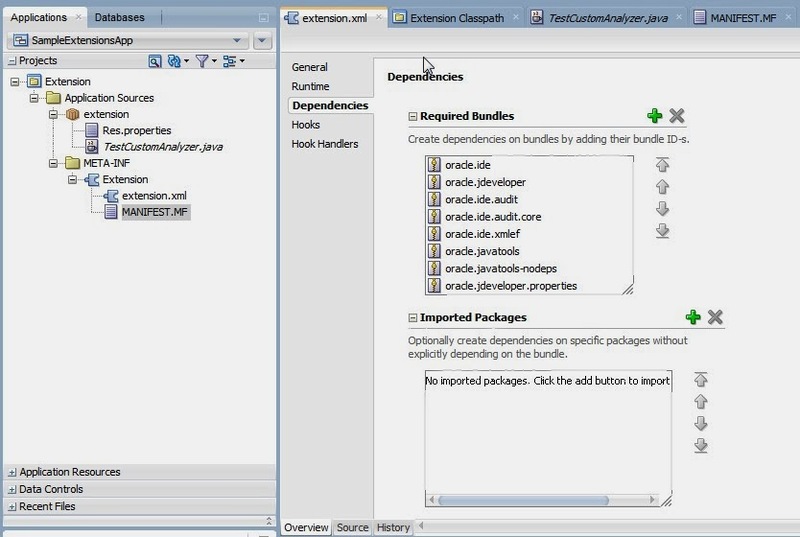 In my last post Creating and Debugging Jdeveloper 12c Extensions project, I explained how to download Extensions SDK and create a new Jdev Extensions project. But that was not all to set and start creating jdev extensions. After creating the project, there is very important step which has to be taken care of to start working with extensions. At this point if we go and create our custom Audit Analyzer (jdev extension rule analyzer), it gives compile time error for the framework class Analyzer not found. The catch to this is that we need to add bundles in Manifest.MF file and dependencies in Extensions.xml file. For this , go to Extensions.xml overview tab and go to Dependencies. There you can see that Required Bundles are empty. 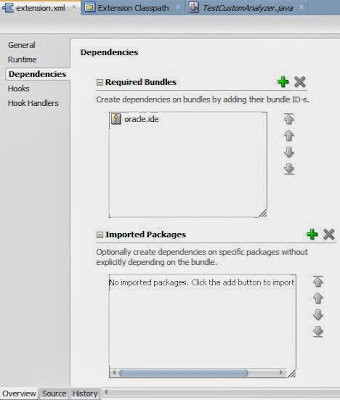 The Required Bundles should have lib which will be used in the project. For this, go to Manifest.MF file and add the bundles like below. Save it, and now if we see Extension.xml, it has all the required bundles. 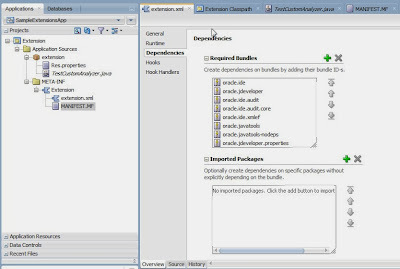 Adding dependencies to Extension.xml will result in changing Manifest.MF and vice-versa. Any of two can be used to do this step. Now we are done. If we go to Custom Analyzer, we can see that it has access to framework extension class. Now we are all set to code and test new Jdev extensions.